Live and love the beach life at A Place at the Beach III Resort in North Myrtle Beach, South Carolina! Placed in the lovely Shore Drive area, this oceanfront vacation resort condominium is the ideal place to secure your beach vacation dreams. Indulge all senses as you escape into paradise. See the shimmering Atlantic Ocean and the sugary sand. Smell the salty seaside breezes laced with the fragrance of seaweed. Hear the ocean surf crash and fall in regular rhythms. Taste the salted air and the sweetness of life in North Myrtle Beach, South Carolina. Touch the healing waters of the ocean, feel the ridges of seashells in the palm of your hand, and relish the feel of warm sand beneath bare feet. This is your life when you vacation at A Place at the Beach III Resort. A Place at the Beach III Resort is a charming rental condominium complex, three stories high and brimming with the beach life. Each rental condo at A Place at the Beach III Resort includes a well-equipped kitchen with full-size appliances, including a refrigerator, a stove, and a dishwasher - an ideal situation for guests wishing to avoid eating out each meal. The resort offers a washer and dryer, which lightens your luggage, plus eliminates hauling home undone laundry or wasting a precious afternoon of vacation time at the Laundromat! All of the condos at A Place at the Beach III Resort are thoughtfully appointed with nice furnishings. The roomy vacation condos offer private bedrooms and comfortable bathrooms. The bedrooms, bathrooms, and living spaces are refreshingly bright and beachy, a nice balance of feeling at home, yet feeling far away from the busy everyday of life. Each living room draws you out onto the balcony, where you will feel the South Carolina sun on your skin and soak in spectacular oceanfront views. Guests of A Place at the Beach III Resort also will enjoy the free wireless Internet. Each condo thoughtfully provides flat-screen televisions and DVD players to entertain during the occasional downtimes between your North Myrtle Beach vacation adventures. 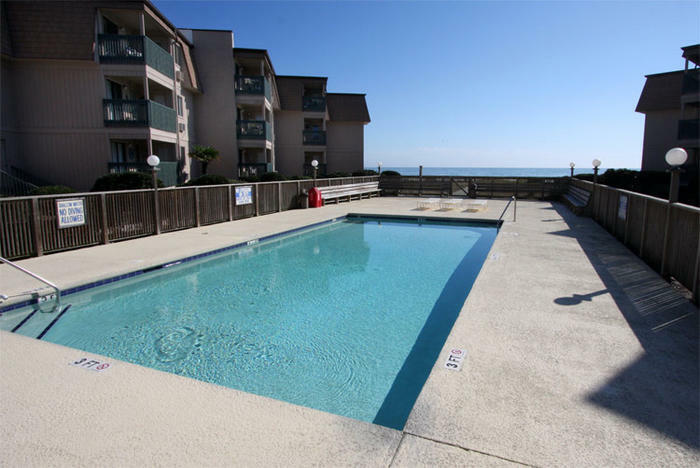 When you step outside of this North Myrtle Beach resort, you will be delighted to discover it offers two sparkling swimming pools pointed towards the glittering Atlantic Ocean. Here, you can swim laps or splash around or lounge poolside for a sunbath. Pack a few good books to enjoy while you effortlessly soak in a suntan to take home as the ultimate beach souvenir! Steps away from the pool area is a centrally located barbecue landing equipped with picnic tables and grills. The area is lighted in the evenings for you to enjoy nightly yummy outdoor meals. If you decide you would like to take a break from whipping up your own meals in your fully-furnished vacation condo rental kitchen, or at the handy grill area at A Place at the Beach III Resort, finding a place to dine out is an adventure in itself in North Myrtle Beach, South Carolina! There are over 1,000 restaurants and eateries in the area, with cuisine of every kind to satisfy each palate in your group. Right next door to A Place at the Beach III is Ocean Annies, an oceanfront beach bar with a party atmosphere. Also nearby at Barefoot Landing is Ultimate California Pizza, where you can enjoy delicious, unique slices. Barefoot Landing boasts other restaurants, like River City Cafe, Flying Fish Public Market and Grill, as well as the House of Blues, which not only dishes up inspired creations crafted by the famous Aaron Sanchez, but also serves up live music. A Place at the Beach III Resort gives you access to all kinds of experiences in North Myrtle Beach, South Carolina. Enjoy a relaxing day at the Myrtle Beach Boardwalk, home to eateries and eclectic shopping. Make sure you step into 26,000 square feet and seven levels of amazing at Gay Dolphin Gift Cove, a locally owned shop that has been a part of the area since 1946! Save room for soft pretzels and fudge and ice cream between all of the incredible eating choices on the Boardwalk. If you are in a playful mood, there are arcades, thrill rides, zip lines, and the famous SkyWheel, an observation wheel with glass, climate-controlled spheres that offer a unique view of Myrtle Beach, plus plenty of fun photo opportunities! Aside from the eating and the shopping and the water sports, North Myrtle Beach, South Carolina, is a paradise for golfers with over 100 courses to choose from! Naturalists will enjoy the state parks, and the artistic crowd will love the various galleries, as well as the Art Museum of Myrtle Beach. Coming or going, A Place at the Beach III Resort is the perfect landing place for your North Myrtle Beach, South Carolina, vacation! Enjoy the coziness of your beach rental condo as a peaceful place to reflect over the day and to share bonding time with family and friends. With the sounds of waves echoing in your head and the fragrance of the ocean lingering about you, you will sleep soundly knowing you found A Place at the Beach III Resort.